THE PROPHET’S PRAISE OF THE PEOPLE OF PERSIA AND THE SHIA DESPERATION OF ATTRIBUTING THE HADITH TO THEMSELVES! 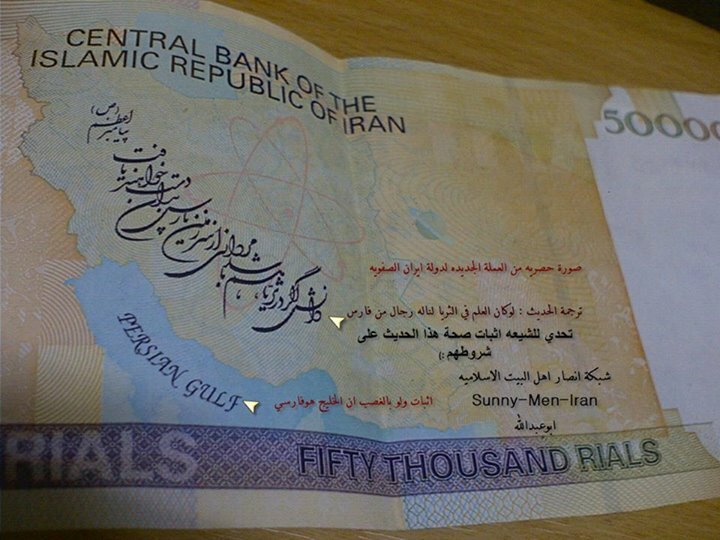 A 50,000 Rial note from Iran. The neo-Safawis have shamelessly printed this PRO-PERSIAN SUNNI hadith on their bank notes. A Sunni Iranian has written on it challenging the Shias to provide this famous hadith AUTHENTICALLY from their own books. Did you know that the Prophet praised VERY FEW lands and its people by specifically mentioning them? As we all know the Prophet (peace be upon him) prayed for Al-Shaam. He also praised Yemen and its wise people. He also praised some major Arab tribes (like the Bani Tamim who are over 90%Sunni to this day, and according to a Sahih Hadith they will be the MOST SEVERE against the Dajjal). What many don’t know though is that the Prophet mentioned another people, a non-Arab people specifically, with a heavy praise and prediction which turned out to be more than true. He (peace be upon him) who did not start an Arab religion (in fact at the beginning his biggest enemies of his call were the Arabs and he fought against many Arab superstitions) praised the Persians who became the guardians of the Deen of Muhammad for the VAST MAJORITY of Iran’s/Persia’s history (900 years of Iranian Islamic history is Sunni, whereas only for the last 500 years Iran is majority Shia, with a significant Sunni minority). Abu Huraira reported: We were sitting in the company of Allaah’s Prophet (sallAllaahu alayhi wa sallam) that Sura al-Jumu’a was revealed to him and when he recited (these words):” Others from amongst them who have not yet joined them,” a person amongst them (those who were sitting there) said: Allaah’s Messenger! But Allaah’s Prophet (sallAllaahu alayhi wa sallam) made no reply, until he questioned him once, twice or thrice. And there was amongst us Salman the Persian. The Prophet of Allaah (sallAllaahu alayhi wa sallam) placed his hand on Salman and then said: Even if faith were near the Pleiades, a man from amongst these would surely find it. 1. Ironically the hadith has been narrated by the companion Abu Hurayrah. A companion the Shias hate with passion (whole books have been written against him, Alhamdulillah there are refutations of major Shia books against Abu Hurayrah available in Arabic and Persian). They accuse him of being an Umayyad stooge and that the Umayyad’s hate nothing to do but to degrade the Household of the Prophet and the Persians. Seems Abu Hurayrah was not the best ‘stooge’ back then, since it is HIM who reported this great praise of the Prophet in regards to the Persians (Abu Hurayrah also narrated one of the most repeated and beloved Hadith by the Shias, where the Prophet called Al-Hassan and Al-Hussein the two masters of the youth in Paradise!). 2. If Shia say that well, it from the methods of debates to argue with the sources of the opponent (since it is Hujjah/a proof to him), then we say that indeed, this principle is true. However, in this case our opponent (the Shias) are not trying to prove something AGAINST us, since we the Ahl Al-Sunnah have proudly included this narration in our second most reliable Hadith collection (Sahih Muslim), we do believe in it and since it is in OUR books we obviously apply it on most of Persia’s history i.e. the Pre-Safavid Rafidi Shi’ite one. 3. The most important point, which is that this Hadith has not been authentically narrated in any Shia Hadith book! Right, Shias (particularly religious Iranian ones) are repeating a Hadith that does not prove anything according to their own religion since it has not been narrated in an authentic form (if at all) in their own books. The Hadith has been narrated by a noble companion (Abu Hurayrah), it is in praise of the Persians, the hadith can only be found in Sunni books, with authentic chains, not in Shia books, very much like how Karbala was not preserved in authentic Shia hadiths. As a matter of fact, most of Persia’s Islamic history was Sunni, more importantly most of the great Persian scientists of all fields were Sunni, so there is no doubt that this Hadith speaks about Sunni Persia and not about Shia Persia. Ironically the Rafidi Shias love to quote this SUNNI Hadith about the merits of the people of Persia (they claim it refers to Imamite Shi’ites who appeared less than 500 years ago as a majority in Persia and have barely contributed to anything except Shirk and Kufr!) we CHALLENGE them to provide the SAHIH Hadith about the virtues of the Persians (narrated BY ABU HURAYRAH!) in their OWN books. Look how the neo-Safavid regime of Iran has shamelessly put this Hadith on their bank notes, a Sunni Hadith that is a proof for US (Ahl Al-Sunnah) and not for them! This entry was posted in Sunnah & Rafidi-Shia history of Iran, The Neo-Safavid State, The People of the Sunnah in Iran. Bookmark the permalink.